The principal New Eisleben High school in Lower Crossroads had to flee from hundreds of pupils yesterday as they went on the rampage vandalising classrooms, throwing stones at teachers’ cars and destroying toilets and plumbing. The rampaging pupils said they wanted the principal, a Mr Mazimena, out of the school as they said he was abusive toward teachers and parents and had allegedly chased a number of pupils out of the school. The school was only opened in October last year. ”We’re tired of the principal. He’s rude and does not respect our parents. He chased a number of students from school. He does not care about other teachers, we want him to leave’,’ said a pupil who asked not to be named. As the protest gained momentum during the morning, the protest turned into a riot. Stones were thrown at cars in the parking lot owned by teachers, shattering windows and denting the bodywork. Stones were also thrown at a car owned by a press photographer and the radio stolen. 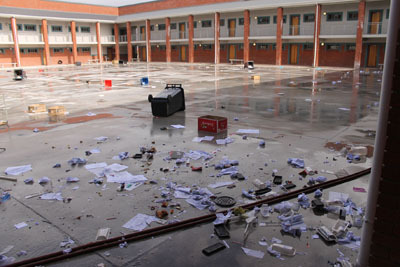 It would appear the protest was hijacked by pupils who aimed to destroy property. Pupil Sanelisile Kroqo said the protest was planned on Tuesday. She said some former pupils who had been expelled from the school for being involved in teen gangs, joined in the protest. ”They vandalised the school, stealing school computers. They left everything upside down,” said Kroqo. Bronagh Casey, spokesperson for Western Cape Education Departmen MEC Donald Grant, said learners threw stones, breaking windows and destroying computers. The motor from the motorised school gate was “torn from its hinges and books in the store room were strewn across the floor”, said Casey. She said teacher were also threatened but “the reasons for the disruption are still unclear” and the department had not received a list of grievances from the learners. However, she said whatever their grievances were, the pupils’ behaviour was “simply unacceptable”. I’m a former student at New Eisleben High who passed last year grade 12. Gives me concern that this the students are not being head to their side. I had a problem with the principal and I took it to the department. The principal is corrupt. When I had to get my statement I had to pay R610.00, R300.00 for matric ball that I didn’t go to(all learns off course) and other R310.00 for saturday classes that the money was paid by the government. My mother was unemployed(still now unemployed) didn’t have that money and went to Department of education reported this but he didn’t give me my results, still now I don’t have my certificate. Brings me pain to not hear out the students side, last year we tried but were shut up and call us name I would be happy the principal of New Eisleben high to be changed, the school is a public free government school, no money being paid that our parents don’t know. I’m not saying the students must toyi-toyi no but the department should do the right thing, we cannot build this nation with corruption and no respect! The government does not pay for saturday classes. The tutors are paid R200 per hour and that comes from learners. There is catering on Saturday including meat and vegetables. This comment above is from a bitter individual. When has the government ever paid for Saturday tutors? Ignorance from a person who claims to have passed. Now the school dies not have printers and photocopiers and relies on neighbouring schools. Why did learners break windows and steal teachers laptops and cellphones? Stop spreading lies.